I don't want to push Christmas before it's time, but here is something you will want to start early so you have it ready for the first of December... a Photo Advent Calendar. 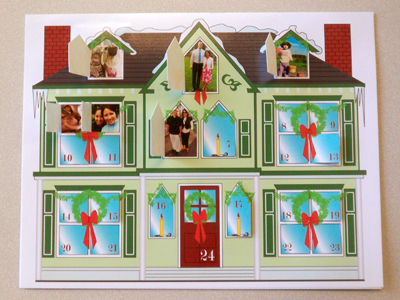 I love advent calendars and wanted one that was personalized. So I created this house design in illustrator and the template for placing the photos behind it. 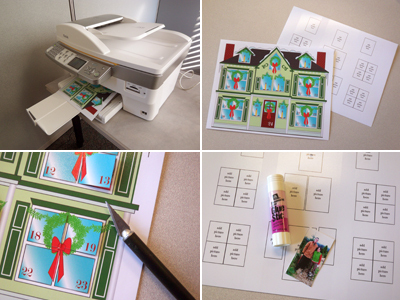 You can download the pdf's to make your own Photo Advent Calendar on 1000 Words and more detailed instructions for making it. You can open a window for each day in December and see one of your favorite photos! 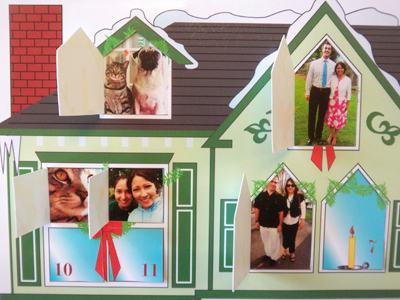 I also made an Oscar and Stewie back panel so you could have a Pug and Cat Advent Calendar if you don't have time to fill one in with your own pictures. 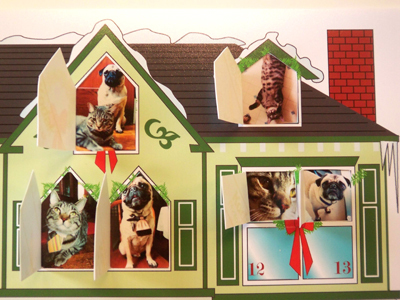 Or maybe you just want a cute Pug and Cat Advent Calendar. You can download this panel at 1000 Words too. This is so cool!! Looks like I've got a creative project for today. Love it! Thank you so much for this Jenny! I have been searching everywhere for an advent calendar for my kiddos! I love this idea even more! BTW I forgot to post the other day but congrats on getting published! I will be picking up that magazine! wow, that's really nice jenny! What a great idea! Thanks for sharing your creativity. I'm a big fan of advent calendars and often have two or three in our house each year. Thanks so much for sharing! This is a great find. That's incredible! Just came about here from the NaBloPoMo randomiser - what a fun place to land! oh i forgot to mention to you since I know you love method products that you can get a cool reusable tote with every $20 method purchase! Did you hear Big Martha passed away today?? I love Advent Calendars too! My mom still buys them for my sister and I (I'm 30 and she's 28). I'm so impressed with how "crafty" you are by personalizing your own calendar. Side note: I'm trying to start my blog again and would love for you to take a look at mine. I heard you speak at the Bulldog Reporter event on Fri in NYC - you were great! Your advent calendar idea is fabulous and I started work on one today - thanks!! Thanks so much! I am a married college student = absolutely no money! It is my in-laws birthdays next week and this is the perfect thoughtful yet totally in my budget gift! what a great idea! Thanks for the templates, too. I'm glad everyone likes the advent calendar. I would love to see what everyone makes! I loved this so much--very impressed! I just shared it on my organization blog. Thanks!